I have voted once in Oregon. 150 potential jurors sitting in a room. “Just being here makes our system work.” Fair enough. So the system is built on waiting. I heard many stories of folks showing up and being dismissed by 10am. Part of me was hoping for that. The other part hoped to see more of how the system worked. Either way, I expected an hour or two of waiting and then either dismissal or selection. 10:15am my name is called. Name? Why do we have these numbers if you are going to tell everyone our name? Off to a court room where jury selection is in progress. Some have already been let go for whatever reason and my group is the back up in case too many others don’t fit. There are criminal cases and civil cases. I quite hoped not to be a part of a criminal case. That starts to sound scary. This case: sexual assault of a 14 year old, expected to last a week. Not the simple, just see how the system works case. And exactly the sort I don’t see myself being very good at. This could completely ruin the defendant’s life and all based on the word of the people involved. No physical evidence was expected to be involved. No facts. Just trust. I don’t trust well. About being a number and not a person. At work, that notion would destroy me. Here, that’s exactly what I would hopeful. The juror selection process involves both sides asking prospective jurors questions about their life experiences in an open court room with the accused present in the room. Is this always the case or depends on the charges? I was relieved to not be part of that initial group. Instead I got to sit in and observe as a back up while 29 folks told the room their names, explained relationships, professions, hobbies and so on. And then specific questions that each lawyer thought might be fit in narrowing out the group. Locomotive engineers really do exist! I wouldn’t have been very comfortable with that. And didn’t have to be in the end. They found their jury and around noon I was sent back to the jury Assembly Room, expecting to be dismissed soon. I waited. For a while. Then I waited some more. At 3pm there were still a few cases potentially going to trial sitting out in the system. Back to the “just being here makes our system work”. Us being there, ready for assembly, ensured that either those cases would be settled without a trial or if it came to it could be tried in a fair trial. The room was dismissed at 4pm. Good idea to forgo laptop for just an iPhone? Six hours of waiting says no. 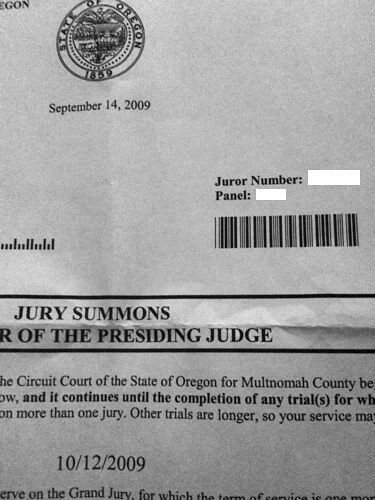 I was called for jury duty back in spring, for an armed robbery case. We sat, and waited, and got the “just being here makes the system work” spiel as well. I guess it really did work, because just the fact that there *was* a jury impending (we never got to the actual selection process) was enough for them to finally settle before the trial. So I spent two hours there, basically doing nothing. Then I went back to work. I think I got paid $11.